One of the compelling reasons for acquiring a building of the Academy's own was to provide for a permanent and suitable place for its substantial and growing collection of books — which in 1923 stood at about 7000 volumes and was estimated to have a future growth rate of 600 volumes a year. 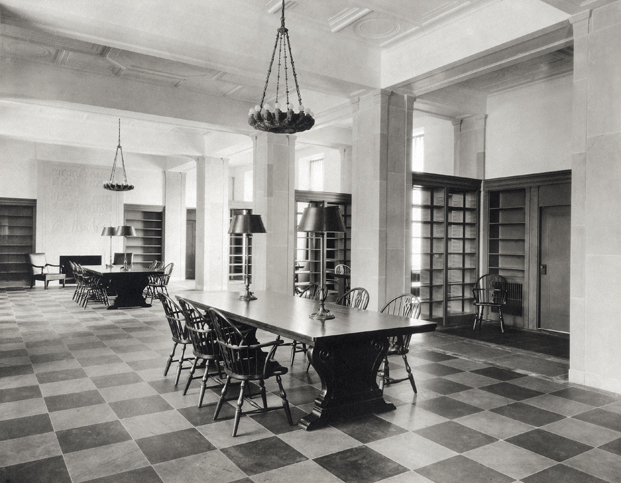 The room, located on the west side of the entrance foyer, was designed to be a working library whose holdings would be mainly publications bearing directly on the Institution's work. The collection was intended to supplement rather than duplicate the holdings in other Washington libraries, many of which were affiliated with major universities. Even with these restrictions, the need was seen to have a card catalogue with a capacity for 600,000 items.16 For more than seventy years, the Academy's library was in fact a working library. Then, in 1995 the library facilities were moved out of the Academy building to an office building housing the staff of the NRC. The Library in the Academy building was converted to the Members' Center, to be used by visiting members. The original Library in 1924 shortly after completion of the building. NAS Archives. embers' Center Ceiling Detail by Lee Lawrie. Bookcases still line the walls of Members' Center, and the fireplace on its west wall has an overmantel carved by Lawrie that illustrates the history and development of writing systems and technologies. Each group of figures in the tableau represents the writing methods and languages of a historical period, and an obelisk at the center has the inscription “To ages yet unborn in accents yet unknown.” Lawrie also sculpted three ceiling panel reliefs. The first, titled “Discovery,” depicts Archimedes using a lever and fulcrum; the second shows a muse recording the discovery on a tablet; the last panel in the sequence shows a seated student with a scroll, reading the record of the discovery. 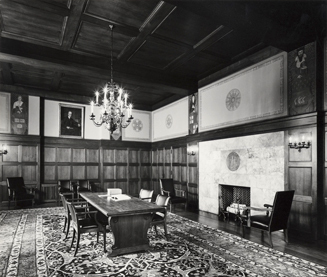 In the original plan, next to the Library is a smaller room, called the Reading Room (now known as the Members' Room), designed as a private space reserved for use by members of the Academy and the National Research Council who were visiting Washington. The private nature of the room was underscored by its relative inaccessibility: Originally, it could only be reached by way of two narrow passages on the west wall of the Library. Consistent with the overall look of the Academy building, the ornamentation of Reading Room was executed in a neoclassical style. Lawrie's art deco interpretation of the Academy seal is carved into the Sienna marble fireplace. A draped female figure, partially overshadowing an eagle clutching a Roman fasces, carries the torch of knowledge. 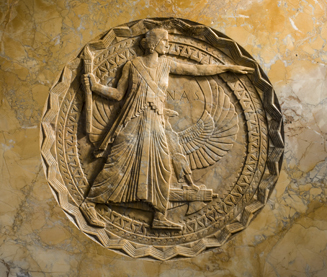 Dunn, in admiration of Lawrie's “strident Victory,” proposed to the Council in March 1924 that it be adopted as the official Academy seal to replace the original seal created by Felix O. C. Darley, which had been in use since January 1865. Dunn's proposal was not supported.17 In 2002, however, Lawrie's more streamlined version of the Academy seal was adopted for official use on publications, cards, letterheads and the like, although Darley's version of the Academy seal is still used on the diplomas presented to members upon election to membership. of the ceremonial rooms in the historic core of the NAS Building. This photograph dates from circa 1973. NAS Archives. 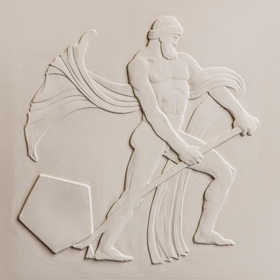 The NAS seal as interpreted by Lee Lawrie is shown in bas relief detail as it appears on the fireplace mantel in the Members' Room.